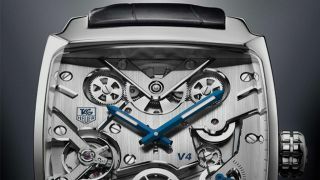 Tag Heuer today announced a partnership with Intel and Google to make an Android Wear smartwatch. A damn nice one, we hope. The watch will probably be in a case that echoes the classic Tag Heuer Monaco "square but not quite" shape pictured here, but we can't say for sure as there were no details of shape, price, features or differentiators of any kind, and the launch date is "By the end of the year". Google's Android Wear director of engineering David Singleton confirmed to us that the watch will run Android Wear, "bringing the vast ecosystem of developers who design for Android"
Since it seems unthinkable that will ever work with iOS as that would give Google an app store within the App Store, the chances of it working with Apple's platform seem very slim, but Tag Heuer board member Jean-Claude Biver seemed to imply this was something that could be resolved by the "end of the year" (the western one, he helpfully clarified). So, in soundbites the Tag Heuer connected watch is: "A connection to tomorrow," "a mix of technology and beauty… emotion on the one hand and innovation on the other," is "forging a new evolution of the future of wearable tech" with Tag and its new tech pals, "blending expertise to build a device that people will love… To build a more beautiful smartwatch." Jean-Claude Biver seemed unaware of what Android Wear is, asking Singleton, "Has this been in any other watch before?" He was on stronger ground with his tech metaphors, though: "Only the dead fish swims at the speed and direction of the river," he declared, adding, "We will never be dead fish. We are a fish that is alive. Being first, different, unique gives you the assurance you will be ahead." "It will be made in Switzerland. 80% of the value will be from Switzerland. But if its engine is a microprocessor and that comes from outside of Switzerland we can't name it 'Swiss made'."